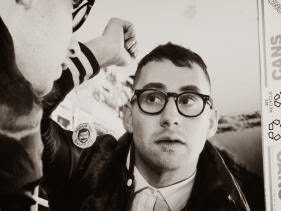 Jack Antonoff (of fun.) has revealed details of Bleachers' (his new electro-pop project) debut album via a Craigslist ad. The album, titled Strange Desire, will be released on July 15th. You can read Jack's message that he posted on Craigslist below. 'strange desire' is something that came to me a few weeks ago when i was working on the last song i wrote for the bleachers album. the lyric is, "feeling like i never was young i followed a dream and a strange desire". it was just something that came out in a scratch vocal take off the top of my head and i didn't realize how important it was in that moment. that line speaks to my entire life over the past 14 years of writing and being on tour. i do feel like I'm constantly mourning a childhood i never had. mostly because i dealt with a lot of loss in the most formative years of my life. that ties into a lot of the lyrics on the album. specifically 'i wanna get better' - "while my friends where getting high and chasing girls down parkway lines i was losing my mind...". i felt completely freaked out at a moment in life that was supposed to be carefree. i let go of a lot right then and started to follow what i now call a strange desire. its the 2 words that perfectly title what this bleachers album is as a documentation of my life as i can remember it at this point. or better put, as i see it from this point. its been a bizarre and wonderful decade (particularly the past 2 years). a lot of great things have happened but its also been strange. this album speaks to all of that. i never kept a diary over the past year of being away and thinking about my life as it has unfolded - instead i wrote this album. so now its time to move on from the 'making the album phase' and start to make the plans to give it to you. that will be july 15th. now you know that. as much as its weird to admit, sharing this album is as important as making it for me. I'm able to move on with my life from hearing the stories of what people have been through as well as telling them myself. people hearing my stories makes me feel less alone, hearing others stories does the same..... strange desire etc.